Congratulations! You’ve Scored On Par or Above The National Average in Emotional Awareness. Thanks for taking our National Mental Health Survey. Your contribution to the survey is helping us collect data to transform the way Australian’s understand mental health. We believe that you’re a pioneer in leading Australia’s towards a more compassionate nation. We want to empower you to become a greater advocate for compassion-based leadership. Based on your results we’ve tailored some resources guaranteed to assist you in deepening your emotional awareness. Check them out below. By 2020 mental health is set to be the world’s biggest health epidemic, and we need your help in changing that statistic. In order to see a shift in social change, we need to become more compassionate individuals. Even though government and corporate organisations are responsible for social change, these organisations are run by people. As individuals, we each have a responsibility to start acting in a way that disrupts what’s considered normal and treat each other with more compassion and to do that we need to increase our emotional awareness. Love reading a good book? 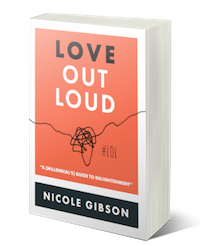 Love Out Loud is packed full of information that dissects what to expect on the path to enlightenment. It’s never a straight line or a clear path, but Love Out Loud breaks down the journey so you can start to build your own map. It will help guide you so you can find your own answers and help you create a lasting relationship with the person that matters most – yourself. Belief is the greatest foundation we have. In the 1950’s we believed that it was impossible to run a mile in a minute, but as soon as Roger Bannister broke the record, sprinters everywhere started running mile minutes. There were no technological advances that helped these other runners, it was simply that they now believed that it was possible to run a mile minute. What beliefs do you have about yourself that are holding you back? 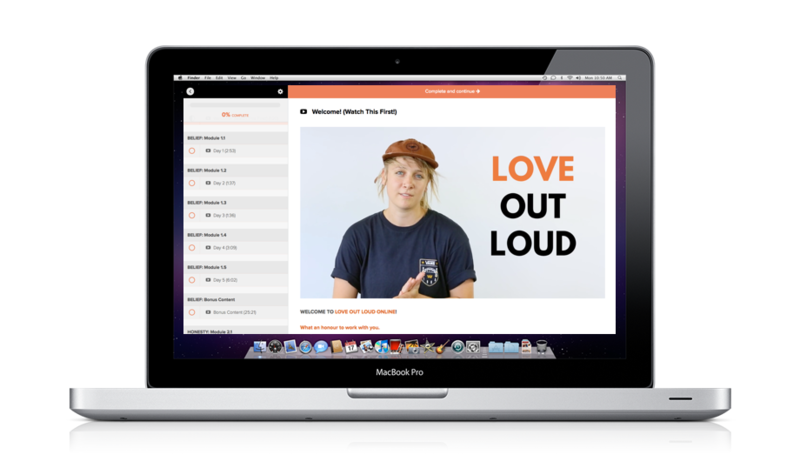 Love Out Loud Online is a 9-week online program that complements the book. The first week explore the concept of belief and we’ve made it available for you to trial. It involves just 10 minutes a day with no sign up required. Check it out for yourself! Looking for the ultimate life hack? Love is the answer. Check out Nicole Gibson’s Ted Talk at Oxford University from earlier this year. Learn how love is the only solution to all of our problems. Wanting to create change in your workplace? Do you feel like your workplace needs a better understanding of emotional awareness? Having a more compassionate workplace where employees feel safe to express is proven to increase productivity, creativity, and overall wellbeing. Our team is available for consultations and has worked with a variety of clientele from not-for-profits, government organisations, and corporate organisations. No workplace is too small or too large to see the benefits of a team that understands compassion. Are you ready to level up your leadership? We’re hosting an executive retreat in Bali in March 2018 and taking EOI’s now! Let us know if you’re in: events@nicolegibson.com.au with the subject heading EOI BALI and we will reply with further details. Room for improvement! You scored below the national average in emotional intelligence. But don’t be discouraged! With some simple steps, you can really learn to get a hold of your emotions and quickly improve your emotional health. You’re not alone! By 2020 mental health is set to be the world’s biggest health epidemic, and it’s because no one is teaching us how to better understand our mental health. We talk about the problem a lot in the media, but no one is actually talking about tangible steps to improving the problem. Based on your results we’ve tailored some resources guaranteed to assist you in deepening your emotional awareness. Check them out below. We’ve also compiled a worksheet specifically to your needs, designed to be used as a daily journal. Try it for a week and feel the difference! Love reading a good book? Love Out Loud is packed full of information that dissects what to expect on the path to understanding yourself. It’s never a straight line or a clear path, but Love Out Loud breaks down the journey so you can start to build your own map and know what to expect. It will help guide you so you can find your own answers and help you create a lasting relationship with the person that matters most – yourself. Belief is the greatest foundation we have. In the 1950’s we believed that it was impossible to run a mile in a minute, but as soon as the sprinter Roger Bannister broke the record, other sprinters everywhere started running mile minutes. There were no technological advances that helped these other runners, it was simply that they now believed it was possible to run a mile minute. What beliefs do you have about yourself that are holding you back? Do you feel like your workplace needs a better understanding of emotional intelligence? Do you feel like people in your workplace are understanding and know how to really listen to each other, or do you feel like no one makes the effort to really hear your concerns? Having a more compassionate workplace where employees feel listened to is proven to increase productivity, creativity, and overall happiness. Nicole Gibson is available to hire for consultations and has worked with a variety of clientele from not-for-profits, government, and corporate organisations. No workplace is too small or too large to see the benefits of a team that understands compassion. Do you feel like you’re ready for an experience that could really challenge the things you believe about yourself, and come out on the other side with a greater understanding of who you are and what you’re truly capable of? We’re hosting a transformative retreat in Northern NSW in May next year and we’re currently looking for expressions of interest. If you’re really looking to take the next step, then please don’t hesitate in sending an email to events@nicolegibson.com.au with the subject heading EOI NSW RETREAT and we will reply with further details.